Inkjet rotation was once a technology that was mainly suited to processing and personalizing financial overviews, invoices or payslips, and direct mail. The print quality, speed, and paper supplied by this smart printing technology has improved significantly in recent years, so this type of printing is also increasingly suited to productions from the more traditional offset segment, but with other possibilities that are more in keeping with modern communication requirements. Nowadays, personal communication is gaining in popularity, and so are organizations that want to reach their target groups in an efficient manner. All this can be achieved with inkjet rotation. By adopting a smart approach to processing data, it is becoming possible to personalize printed material and adapt it to individual requirements. The technology allows you to update a message or content over and over again, so you are able to communicate with a target group in a targeted manner. This is even possible in small print runs and for the same prices! An example of this is a magazine, for example, which can be printed, folded, and attached in a single run, or can be produced perfectly bound. Thick, thin, large, or small, one after the other. 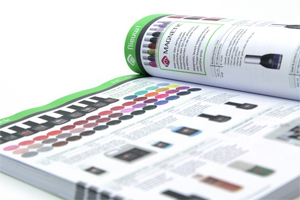 Orders can be placed as and when required and in a print run that is needed at that time, so and organization has up-to-date printed material at all times. What’s more, Inkjet rotation is a sustainable technology, as it allows the printing process to run more efficiently and produces less waste paper. This printing technology also uses special bulking paper with a lower grammage, which reduces shipping costs. Another advantage is that the total costs of print packages can be reduced considerably and organizations can purchase printed material differently. After all, this technology doesn’t require a large volume to be produced in order to achieve better pricing, so it’s no longer necessary to retain stock, and excess printed material that is no longer current no longer needs to be destroyed. For Arrancar, a well-known name in the world of pedicure, beauty, manicure, and wellness, we have used this smart technology for its product catalog, which can now be ordered in small print runs for virtually the same prices. It’s also possible to make simple changes, such as adding or deleting products. Arrancar is therefore able to keep its product catalog up to date at all times! Read how Arrancar is benefiting from inkjet rotation.